Contains Manganese Ore. Area is 411 Has. Sale includes all rights to claim and land ownership. Reserves:	Between 8.500.000 and 11.000.000 tons. Production:	240.000 tons per year of 100% refined Manganese. The underground or sub-surface mining is the technique of mining used in this project, and consist of digging tunnels into the earth following the veins and taking into account structural patterns such as dip and strike, as well as the fault and joint forming. The "Cordillera de Los Andes" is constituted in this area mainly by volcanic and sedimentary rocks from the cretaceous age and have been divided into two groups: Diabasico and Dagua. On the one hand, the diabasico group forms the oriental side of the "cordillera", and the Dagua group form the west side. 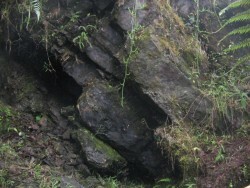 The explored sides are characterized by a deposit of vein system fitted in a sequence of dark grays, blue and green schist, where mineralization change thickness and are composed by carbonaceous masses of manganese (rhodonite and rhodocrosite). The project has the WORK PLANNING AND MINING WORK (“P.T.O”) approved for the Production State. Also an Environmental Impact Study (“EIA”) required by the environmental authorities has been approved and the correspondent environmental license granted. Supporting Documentation and additional information available upon request.